Spring is my favorite season of the year and the older I get the more I appreciate it, the more I need it — this return of life, of the Sun, which, higher in the sky each day, actually feels warm again. Although the nights are still cold, daffodils scattered around the yard and the cheerful orange and yellow calendulas are blooming proof that winter is over. 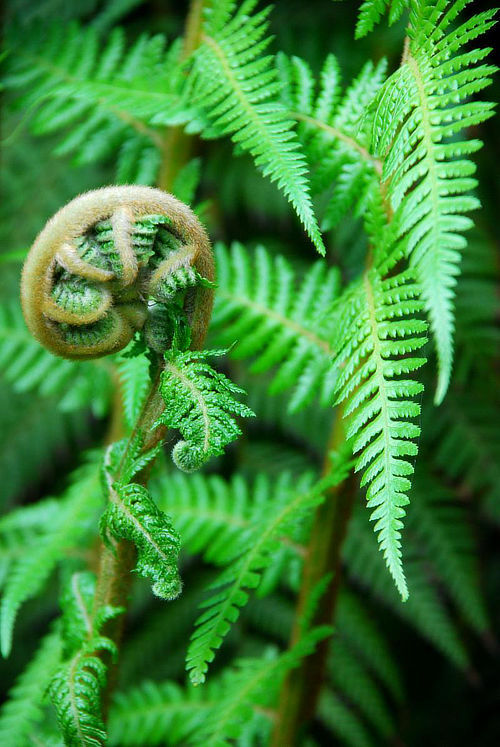 At the forest's edge, trilliums and milkmaids are blooming among ferns, emerging from their winter's sleep, they spiral their emerald heads skyward dressed in their green fractal lace, a perfect symbol of spring. In the small orchard below our house, the young peach and nectarine trees, planted three years ago, are starting to open in full bloom, and the Santa Rosa plum, earliest to wake, is already well past peak, its pale, yellow-green leaves unfurling. Soon we'll see those telltale swellings on spent flower stalks fortelling the number of plums we'll enjoy come July. The apple lags behind the stone fruit, but will soon open their clusters of light pink crepe paper, and the quince is leafing out now too and will soon open its buds in large white flowers. With the blossoms come the bees, and given their current crisis from human beings' sociopathic need for pesticides, it is a miracle any are left. Spring is evident right now, not just in the bees and the blossoms, but in the bird life too. We've been watching a pair of ravens, year-round residents here in our woods, fly back and forth over the garden each day carrying sticks in their beaks, building a nest in some tall redwood or Douglas fir. In the past month, I caught them chasing off a hawk, twice their size. Relatively new vistors on our side of the ridge, they not only threaten ravens and their fledglings, but my hens as they range loose in the yard. Like the ravens, I've also had to stand guard. Earth bound, my technique is a bit different: whooping while swinging a walking stick in the air as they fly overhead, scoping out my fluffy, plump ladies. If my neighbors could see me, they'd think I'd gone crackers. Crazy as it may look, it seems to be working. They're making fewer, faster flybys, hopefully getting the idea my precious hens will not be an easy meal. When the Sun enters the cardinal fire sign of Aries each year, it signals the official start of spring, the beginning of a new season of growth and fertility — here in the north. South of the equator, the Aries equinox marks the beginning of autumn with the harvest season in full swing. The Aries equinox also signals a brand new astrological year, no matter where you call home on the planet, marked by the Sun's entry into this Alchemists once went out at first light to gather dew at this time of year, knowing it was charged with powerful energies of renewal and life.initial sign of the zodiac wheel. So the chart for the equinox, not only tells us about the season ahead, but the entire year as well. And this particular equinox is notable as it coincides with a full moon tightly opposed Chiron. Issues around the need to heal will be a major factor in the weeks and months ahead with this key opposition. Last Friday, I posted an article on this key lunation, here's the link: Equinox/Libra Full Moon. The Druids refer to the vernal equinox as Alban Eiler, which means "Light of the Earth." One of the four alban or "light" gates of the year that correspond to the equinoxes and solstices, Alban Eiler is considered a time when the energies of fertility are at their highest. "Alchemists once went out at first light," John Michael Greer writes in The Druidry Handbook, "during the time from Alban Eiler to Belteinne [May Day] to gather dew from the wet grass, knowing that, at this time of year, it was charged with powerful energies of renewal and life." At Alban Eiler, Coel, god of the hidden life force, is honored, and Aengus Og, the Irish God of Youth and Love, is also remembered. In his meditation for Alban Eiler, Greer wrote that this is a time of the year when the promise of Earth moves toward its summer fulfillment. The birds return with the Sun from southern lands "bearing springtime beneath their wings." When the Sun enters Aries, we arrive at a time when day and night throughout the world are nearly the same length, as close to perfectly equal light as we get. At the Aries Equinox, the apparent path of the Sun crosses the celestial equator on its way north. The celestial equator is simply the Earth's equator extended out into space (shown by the blue disc in the diagram above). So at the Aries equinox, as the Sun crosses this line, light begins to overcome dark in the north, with the opposite in the south. From this moment of Aries equilibrium, the Sun swings towards one of two culmination points in the year, the Sun's northern extreme marked by the June solstice: longest day of the year here in the north, shortest day down under. The northern hemisphere's vernal equinox and the beginning of spring is associated with Easter, the Christian observance of the death and ressurrection of Christ. One of the moveable feasts, the date each year is set for the first Sunday, following the first Full Moon after the vernal equinox. This year, Easter is as late as can be as a Libra Full Moon falls right on the day of equinox. Coming a whole lunar cycle later, on April 21st, Easter will follow a second Libra Full Moon (a Blue Moon, astrologically speaking) on the 19th. The Sun will actually be in Taurus for this very late Easter, with the ingress the day before. Ostara is the name given the modern pagan festival associated with the vernal equinox and also a Teutonic goddess of the dawn. The German root "ost" means east, easterly or east wind — the direction of the rising sun, where the new day dawns. You can see this same root in the German word for Easter: Osterfest and also Ostern, Österlich, and Ostersonntag (Easter Sunday). For Spring's direction is ost, as the seasonal equivalent of the dawn, the dawn of the natural year. 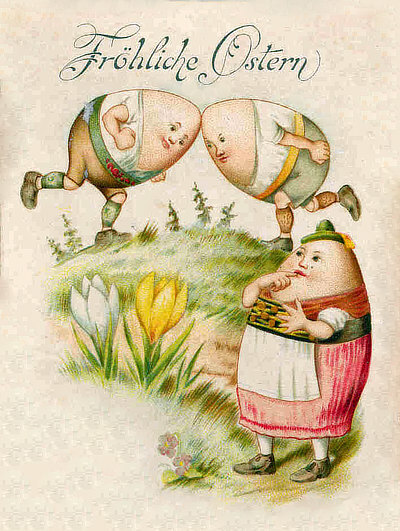 The vintage German Easter card shown here is a charming illustration of the rambunctious energy of spring. The Vernal Equinox also marks Norooz, the Persian New Year, a celebration of renewal and rebirth. Partly rooted in Zoroastrian traditions, the Norooz celebration however is not religious, ethnic or nationalistic. 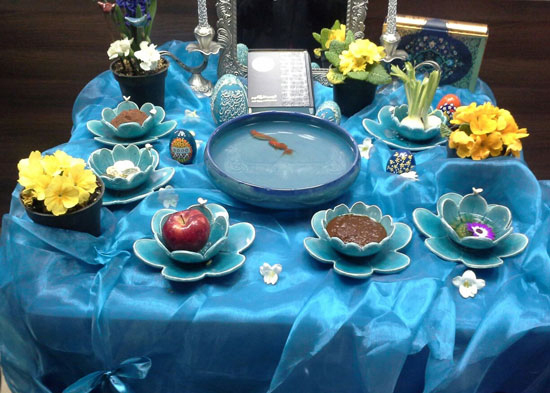 Jewish, Zoroastrian, Armenian and Turkish people in Iran and throughout Central Asia celebrate Norooz. Preparation begins in early March with the sprouting of sabzeh (lentil, wheat, or barley seeds) and a thorough khane tekani, spring cleaning. Symbolically, house cleaning is done to prepare the home for the return of the spirits of the ancestors who help nourish and bless the growth of the sabzeh, which in turn represents the wellbeing of the family, the success of the growing season and the subsquent harvest to come. One March, many years ago now, my Armenian father-in-law sprouted sabzeh, lentil seeds, with my daughter, who was then just a toddler, introducing the traditions of his childhood in Iran to his granddaughter. Last year, in his memory, I sowed clover seeds in a circular bed in the backyard for an outdoor, perennial sabzeh, and also in two little clay pots to place on the haft seen, an altar, or the Persian New Year's "tableau vivant" as Azita, in her wonderful Persian food and culture blog — Figs and Quince — calls it. In this post Azita shares directions (with photos) for sprouting sabzeh. Along with a bowl of sprouting sabzeh, colored eggs, a small goldfish bowl, flowers, especially primroses, and other symbolic offerings are placed on the altar. As Azita explains, haft seen means "seven S's" — for at least seven traditional, symbolic items that begin with the letter "S" are placed on the altar: seer (garlic) which symbolizes health; sabzeh (sprout) representing renewal; seeb (apple) = beauty; sonbol (hyacinth) = spring; sekkeh (coins) = prosperity; serkah (vinegar) = patience; sumac (a popular Middle Eastern spice) = sunrise; senjed (oleaster fruit) = love; and samanoo (wheat germ pudding) = affluence. Candles, a mirror, a bowl of gold fish, fresh flowers, rose water, a holy book from one's faith, or the poetry books of revered Persian poets Hafiz, Rumi or Khayam, decorated eggs, and a mixed plate of traditional Iranian shirini (pastry) are other items often included. The family gathers around the haft seen at the exact moment when winter ends and spring begins, the dawn of the "New Day" — Norooz. That oversized bunny that brings us chocolate gifts in egg baskets is also long associated with springtime and Easter. The egg and the extremely fertile hare are old, universal symbols of rebirth and renewal of life at the vernal equinox. In Celtic lore, the hare is often depicted carrying an egg, both symbols of the new cycle of life that arrives each spring. "The hare is an "attribute of all moon deitites," J. C. Cooper wrote in Illustrated Encyclopedia of Traditional Symbols. "Closely connected with the moon it represents rebirth, rejuvenation, resurrection, and also intuition: 'light in darkness.'" The image of the hare in the moon appears in spiritual traditions the world over. In China, the hare is also associated with the Moon and represents feminine "yin" power. It is often depicted with a mortar and pestle mixing the elixir of immortality. The European or Brown hare (Lepus europaeus) is native to Europe and parts of Western Asia and Central Asia. Usually nocturnal and skittish, they change their behavior dramatically in the spring, when they can be seen in daylight hours chasing one another around fields and meadows. During this spring frenzy, they often strike one another with their paws like a couple of boxers. For a long time, this was thought to be competition between males, but closer inspection has revealed it is actually females hitting the males, sometimes to show an unwillingness to mate or as a test of his determination. Hares are an ideal fertility symbol as the female is especially fecund, able to concieve a second litter while pregnant with the first. Lewis Carroll famously incorporated the March Hare in Alice's Adventures in Wonderland. Sir John Tenniel's illustration for the book above shows the Hare with straw on his head, a common way to depict madness in Victorian times. For each dye bath prep 4 cups of chopped or mashed fruits or veggies and boil in 4 cups of water to which you've added 2 tablespoons of white vinegar, a fixative without which the dye will not adhere to the shell. (Use about half this amount of water for a spinach dye or the color will be too light.) Let the mixture simmer for 20 minutes after which you can strain the dye for a uniform color or leave unstrained for a mottled effect. The longer the eggs remain in the dye bath, the richer the color. Allow the hard-boiled eggs to cool completely before dyeing. If you have a white or other light colored crayons, you can make wax resist designs on the eggs before soaking them in the dye bath. 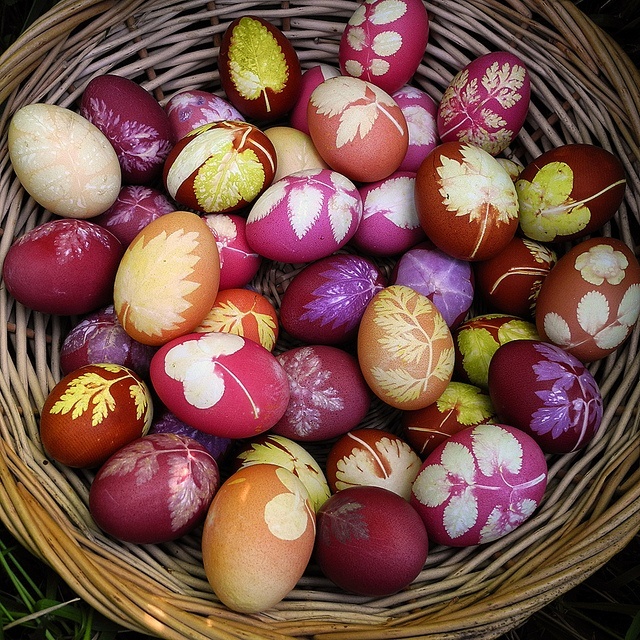 Dyes leave a matte finish, but if prefer glossy eggs, add a few drops of vegetable oil to the dye bath and polish the dyed eggs gently with a soft cloth. Or you can speckle your eggs. Here's a helpful post on the blog little rusted ladle with photos and clear directions for speckled blue eggs using coconut oil, the idea inspired by enamel ware. And if you are really into it, you can create these really lovely, nature-inspired Easter/Ostara eggs, impressed with herb leaves, ferns or other lacy veggie leaves. Just follow the directions on the Better Housekeeper blog. In closing, I wanted to share this odd little poem about spring by e.e.cummings as it captures that crazy invitation to join life full swing that spring really is (so many kinds of yes). The rhythm in the first stanza reminds me of a jumprope rhyme or the motion of a swing. The other lines are different, but still you have to get the rhythm right as you read for the sense to fall out of it. I think the March Hare would've loved it. Blue Moon Astrology is free of ads and free to all. If you enjoy reading this blog, please consider making a Gratitude Donation — very much appreciated! Thank you! If you'd like notification when I post new essays: subscribe to my mailing list. The information about the European Hare came from this informative Wikipedia article. Some of the information about Norooz shared in the article is from this website on Persian culture. The illustration from Alice in Wonderland was by Sir John Tenniel (image courtesy of Wikimedia Commons). 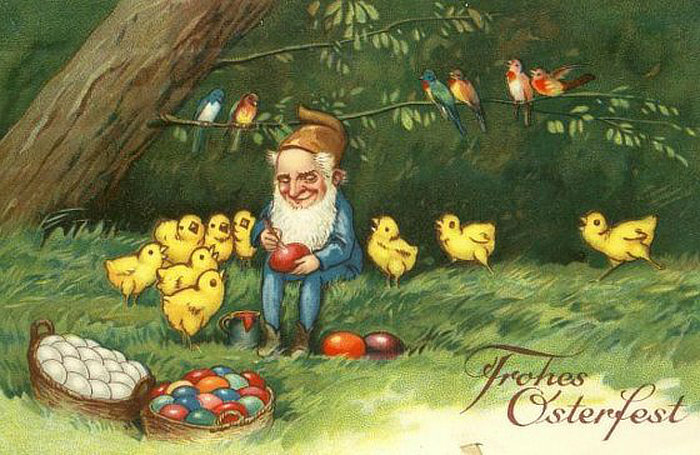 The German Easter card is vintage, illustrator unknown. The diagram showing the celestial equator is diagram from the University of Tennessee Engineering Department's page. Book a Reading with Elaine! The increased awareness gleaned from a Natal Chart reading can help regain more power of choice and the necessary confidence to move past areas of life where we have been perennially stuck. In many ways we learn the most about ourselves through important, intimate bonds. This reading will help you understand the interpersonal dynamics involved in one special relationship. Comprehensive session to closely examine the major cycles and trends for the year ahead. What are the potential challenges and opportunities? What areas of your life are most likely to be affected?